Once upon a time, there was a man who lived near Boston, MA. I think he was a fisherman. No, wait, a sea captain! This man had a wife named Anna. Anna was sweet, but unfortunately, she was very lazy. Well, actually, she wasn’t lazy at all, just very shrewish and not nice to her husband. She was so lazy (or ill-tempered) that all she would feed her husband for dinner was cornmeal mush and molasses. Or maybe she went out for a bit, and that’s all she left him to eat. Well, whatever the case, her husband got fed up with all that nonsense. He took it upon himself to mix together a bread of his own devising, stirring flour and yeast into the cornmeal mush, adding the molasses for flavor. But then again, he may have gotten so angry at Anna that he lobbed a sack of flour at her, which ended up in the cornmeal mush instead. At any rate, he then uttered the timeless phrase, “Anna, damn her!”, and the bread was so delicious, their neighbors all started baking the bread, and the hapless name stuck. And that’s the true story of how Anadama Bread came to be called so. Oh, unless Anna was actually very sweet, and would bake that delicious and long-keeping bread for her seafaring husband and his crew, who would affectionately refer to her as “Anna, damn her!”, in which case that’s the true (if less-repeated) story. What I’m getting at here is that no one is certain where this bread got its name. Food historians look as these tales with a rightfully dubious eye, though they can offer up no more convincing nomenclature. All we know for certain is that the name originated near Boston. But cornmeal and molasses have long been staples of the New England pantry; and in fact, the use of these ingredients in breadmaking has a far longer history than the name “Anadama”. Such early staples of the Northeastern US as johnny cakes and Indian bread both relied on the combination of wheat flour, cornmeal, and molasses, as early as a 1796 appearance in a cookbook. So the bread itself was nothing new by the time a patent for “Anadama Brand Bread” came along in 1850, as the earliest recorded reference to the name. But wherever the name came from, or whatever you call it, the bread has stuck around because it is a darn good bread. 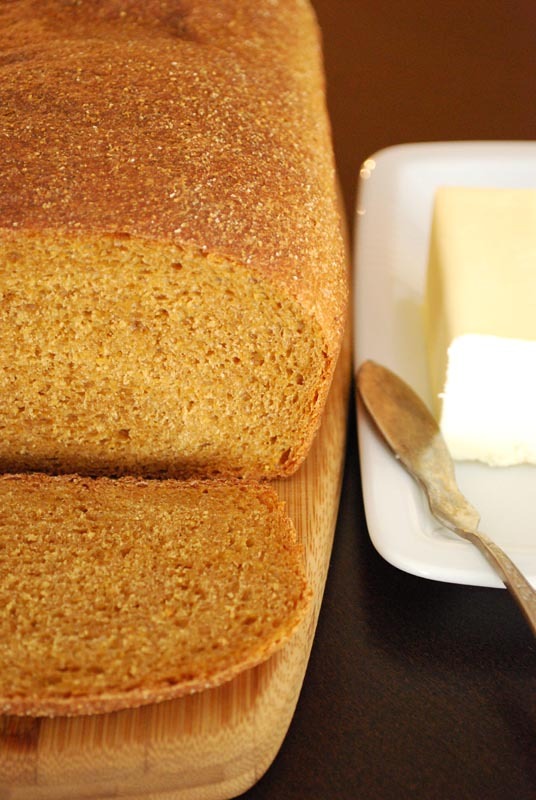 Made with whole-grain flour and cornmeal, rich and dark with molasses, it’s a wonderful change instead of a typical sandwich bread, or morning toast with butter. The bread bakes up nice and dark, with a slightly firm crust, and a tight crumb inside. There’s a lovely texture from the cornmeal, but it isn’t at all hard or crumbly, as it gets softened with boiling water before getting mixed into the dough. You may think the dough is a bit too wet while mixing, but it will firm up a little as it rises and more gluten forms. Enjoy! 1. In the bowl of a stand mixer, or any other heat-safe bowl, combine the cornmeal, salt, butter, and molasses. Pour the boiling water over the mixture, and stir until the butter is melted and everything is combined. Cover with plastic wrap and let rest for 45 minutes. 2. Reserve 3 ounces (about 3/4 cup) of the flour; set aside. Add the yeast and the 1/2 cup water to the cornmeal mixture in the bowl. Add the remaining flour slowly, while mixing with the dough hook at low speed, until incorporated. Increase the speed to medium or medium-low, and knead for 8 to 10 minutes, adding the reserved flour as needed to achieve the proper consistency. The dough should be sticky, but should clear the sides of the bowl. 3. Turn the dough out onto a lightly floured surface. Knead a few times, until the dough forms a skin around the outside, and shape into a round. Transfer to a lightly oiled bowl, turning to coat the dough. Cover with plastic wrap, and let rise until nearly doubled, about 50 to 60 minutes. 4. Butter or oil two 9 x 5 loaf pans. Turn the dough out onto a lightly floured surface. Divide the dough into two equal pieces. Press and roll the dough into loaf shapes, pressing to seal the seam. Place the pieces, seam side down, in the prepared loaf pans. Cover with lightly oiled plastic wrap, and let sit at room temperature until nearly doubled, about 35 to 45 minutes. Preheat the oven to 375º F.
5. Bake the loaves at 375º F for 30 minutes, or until an instant read thermometer registers 190º F when inserted into the middle. Remove from the pans, and let cool on a rack thoroughly before slicing. 1. If you’re using active-dry yeast instead of instant, use two whole packets. Stir it into the 1/2 cup warm water, and let sit about 5 minutes to make sure the yeast is thoroughly dissolved.